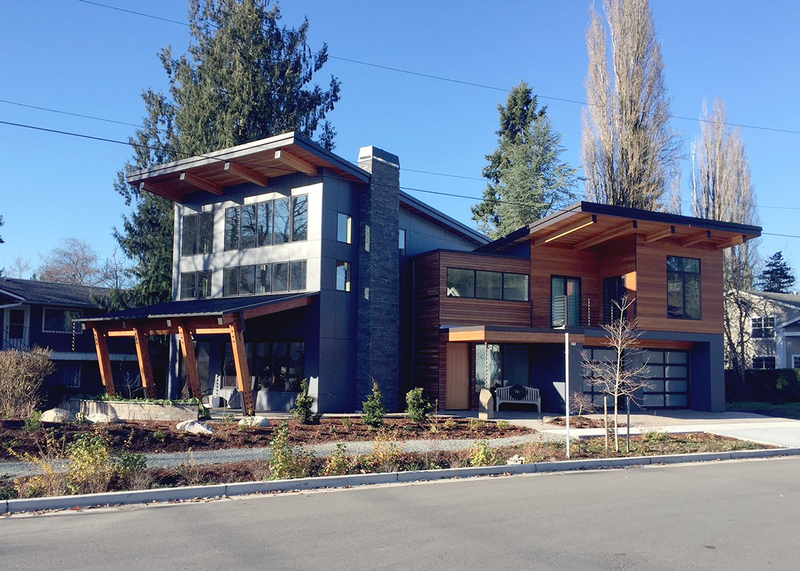 A new home custom built by the owners in downtown Issaquah blazes the trail for advanced performance and Built Green® 5-Star certification under the City of Issaquah's expedited permit incentive program. The home was designed and built to give the owners decades of great comfort and ridiculously low energy costs. 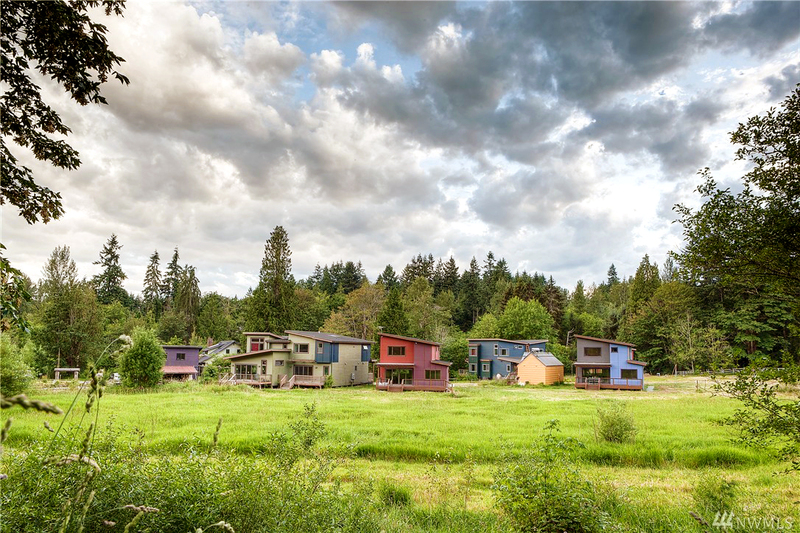 The site is on an odd-shaped lot next to a park and within a block of Issaquah's historic main street, with excellent access to transit and community resources. The site is provided with infiltration swales for the roof water drainage that are integrated with native and drought tolerant landscaping. Hardscapes are 100% pervious. Indoor water use is reduced by the use of low flow sink and shower fixtures and WaterSense-labelled toilets. This super-insulated home is constructed with Structural Insulated Panels. SIPs are a prefabricated sandwich of plywood and foam that eliminate most of the wood framing, and with it the thermal bridges that reduce insulation value in standard construction. The builder did such careful air sealing that the home is the tightest the third-party verifier has tested in 14 years of practice! At the same time, abundant fresh air is provided by the Zehnder HRV system that was carefully installed and commissioned. The home emphasizes simple interior finishes with low toxicity and excellent distributed ventilation for fresh air. There are no carpets and flooring is NAUF bamboo from Higuera Hardwoods. Natural cedar ceilings and other highlights are finished with Safecoat Polyureseal and all of the paints are <1 g/L VOC. The kitchen and bathrooms contain custom cabinets by Superior Manufacturing, made with special order glues and finishes. Whole house ventilation is supplied by the central Zehnder comfo-air HRV. This system uses innovative 3" plastic flex ducts to provide a supply of fresh air and exhaust for every room. It operates continuously and quietly with very low energy use. This is an important companion to the incredibly air tight building envelope to ensure comfort and performance. The exterior siding is installed over a "rain screen" air space. The building moisture barrier is a Prosoco liquid applied coating, along with interior tapes from SIGA on the SIPs panel joints. Detailing of weather seals at windows, doors, and other penetrations was carefully done by the owner/builder to ensure moisture will not enter the home. The home's structure itself reduces the use of lumber and heavy materials with the SIP panels. In addition, recycled content metal roofing creates very long-lasting protection. 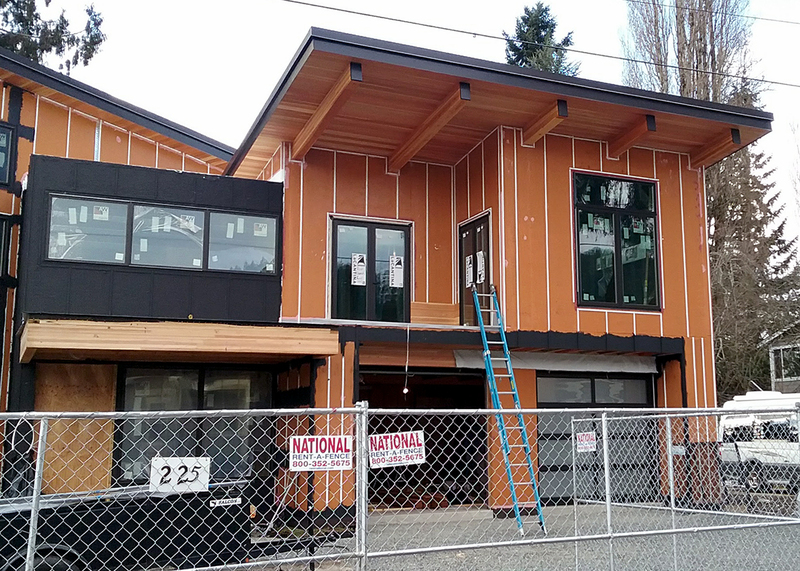 The exterior is a mix of Swisspearl panels that were recovered from a commercial job site, composite timbers, and natural cedar siding for an appealing Northwest contemporary look. Swisspearl siding panels participate in the EPD (Environmental Product Declaration) system. Interior finishes demonstrate a high level of commitment to non-toxic and environmentally friendly products. The builder took a lot of care to research and specify products. FSC-certified bamboo flooring or tile covers the floors. Interior caulks, adhesives, and finishes were checked for compliance with Built Green's VOC standards. All interior painted trim is MDF Spero from Metrie, which is recycled sawdust with no added urea formaldehyde. The owner/builder personally controlled recycling of jobsite waste, to the extent that even concrete chips from stripping forms were put in separate recycle bins. Hand demolition of the previous house on the site included recycling metal, cabinets, trim, appliances, fixtures, and structural parts. Sage Homes Northwest takes pride in its focus on re-development in the core of Seattle, which reduces urban sprawl and promotes walkability and a sense of community. They have been serving customers since 2006. During the yearlong judging period, they certified 46 homes at the 4-Star level. Isola Homes is a locally owned company dedicated to building homes that embody the evolving needs of homeowners and communities. They are passionate about sustainable design, environmental stewardship and making valuable and enduring contributions to the communities in which they build. In the past year they certified 105 homes at the 4-Star level. 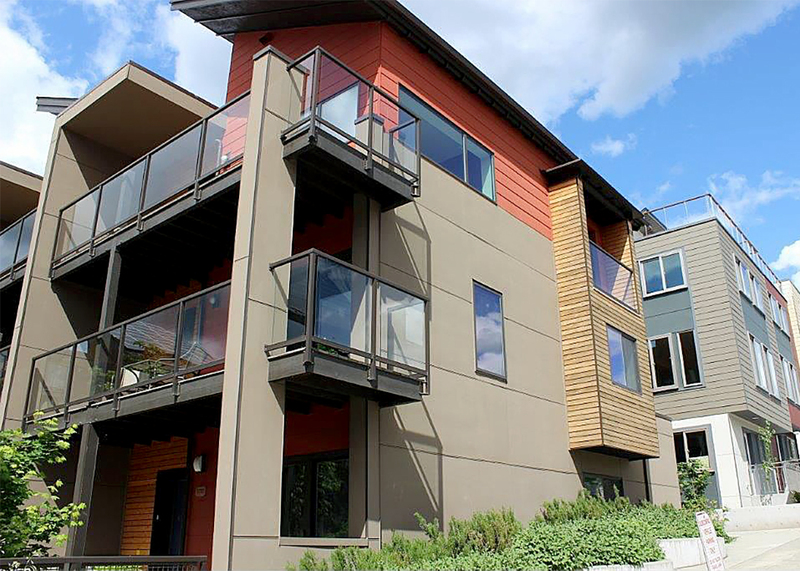 3635 Phinney Ave N LLC sits under the umbrella of Red Cedar Properties LLC , which develops eco-friendly, liveable, small, smart studios. Their winning project is a 4-Star, 27-unit building in Fremont complete with a solar array. Exxel Pacific is dedicated to sustainability through building design and construction practices, as well as embracing it as a corporate culture. The winning project in the heart of the U-District is a 7-story, 84-unit student housing project with a 3,000 square foot historical renovation incorporated into the design. 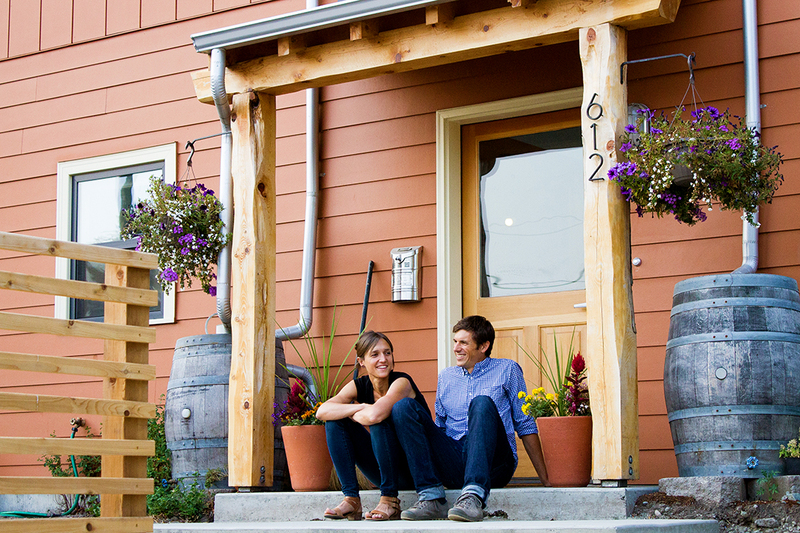 Model Remodel is a design-build contractor located in the Queen Anne neighborhood of Seattle. Building sustainably has been at the forefront of their mission since inception 16 years ago. They always work hard to achieve Built Green certification for remodels of all sizes, even when it is difficult, and they’ve certified two Built Green projects in the past year. Two surprise categories were also announced! Project of the Year was awarded to TC Legend Homes for their work on the West Seattle Emerald Star, along with homeowners Andri and Veena! TC Legend Homes is no stranger to net zero building, but this was their first Emerald Star project. All of the project’s annual energy use will be covered by solar PV and it also contains a 10,000 gallon rainwater storage and filtration system to collect water for indoor use. The Built Green Pioneer Awards are given to people who have played an integral role in developing and maintaining the Built Green program. The first surprise winners were Bryan Bell and Karin Weekly. Bryan and Karin live in zHome, an Emerald Star Built Green project, and ever since they were interviewed by Built Green staff for the post-occupancy study on zHome they have been nothing but supportive of the program, giving home tours and opening their door to media, speaking about Built Green with their neighbors, and serving on panels to talk about their experience. Bryan now sits on the Built Green Executive Committee to lend his perspective as a resident. We are super grateful to have residents of projects get involved in the program, and Bryan and Karin absolutely exemplify that. The second Pioneer Award recipient was Tadashi Shiga, owner and founder of Evergreen Certified. Evergreen Certified has received an award for their advocacy related to Built Green, but Tadashi deserved to be recognized as an individual for his tremendous support of the Built Green program. He is constantly offering his help, coming up with new ideas, and advocating on Built Green’s behalf to transform the area building market. Congratulations to all of the winners and thank you for all you do! 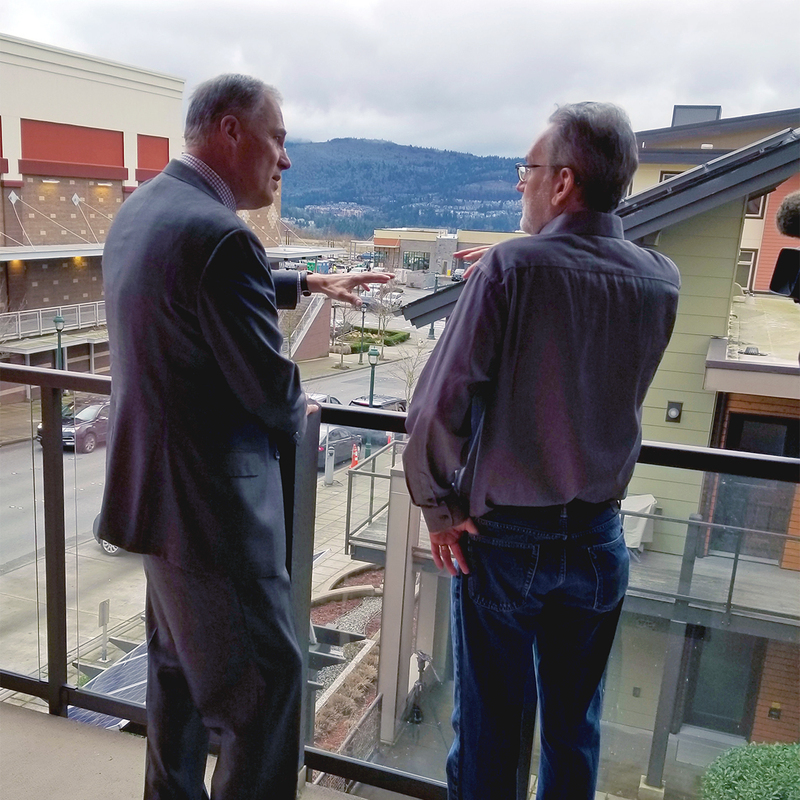 When Washington Governor Jay Inslee made plans recently to visit Issaquah, he specifically asked about seeing the zHome neighborhood while he was in town. The zHome project, completed in 2011, was the first net zero energy townhome development in the United States. Each zHome uses a solar panel array to generate enough electricity to offset all the energy residents use over the course of a year. Governor Inslee has long been a supporter of reducing human impacts on the environment. He wrote a book about it in 2013: Apollo's Fire—Igniting America's Clean Energy Economy. In his 2018 State of the State address, Inslee unveiled his proposal for a carbon tax, with part of the revenue to be spent helping Washingtonians pay for energy-saving insulation in their homes. The Governor's visit to the zHome neighborhood was partly designed to raise awareness for his carbon tax proposal since the neighborhood is, among other things, a good example of the benefits of energy-saving insulation. Here's a policy brief on his proposal. My wife and I purchased a zHome townhome in July of 2014—our first home purchase. Energy efficiency was not on our list of wants when we set out to buy our first home, but the zHome met so many of our other criteria that we purchased it. To our surprise, rather than making concessions with our quality of life to live in a net zero energy home, we have found our zHome to be a significantly more comfortable living space than any place we have ever lived. 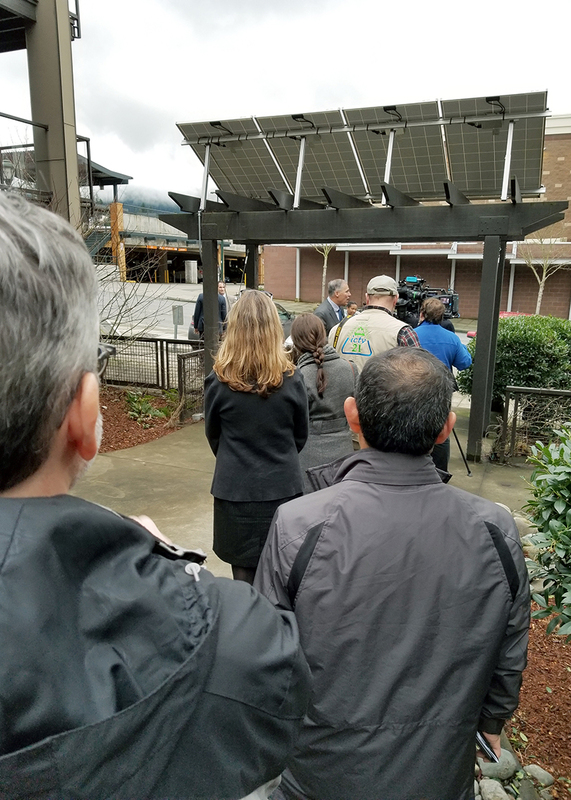 So when David Fujimoto, sustainability director with the City of Issaquah and one of those involved in building our zHome neighborhood, contacted us to ask if we would be willing to give Governor Inslee a tour of the inside of our zHome when he visited our neighborhood, we of course agreed! On February 2, the day of the Governor's visit, Issaquah Mayor Mary Lou Pauly was the first to arrive. She brought David Fujimoto and City Administrator Emily Moon. We got a chance to talk to Mayor Pauly for quite a bit before the Governor arrived. She's quite friendly and knowledgeable about green building. Her husband Karl recently built their new home, which was Built Green 5-star certified. Next, the media arrived, including Essex Porter from KIRO News 7, Jim from KOMO News 4, and Tim Smith from the City of Issaquah's ICTV 21. Here's some video Tim shot. There was also newspaper reporter Nicole Jennings from the Issaquah-Sammamish Reporter. Here's her news report. At about 3:30 p.m., Governor Inslee, his wife Trudi, his Northwest Regional Representative Julia Terlinchamp, his Communications Director Simon Vila, and his Senior Policy Advisor on Energy Lauren McCloy arrived. 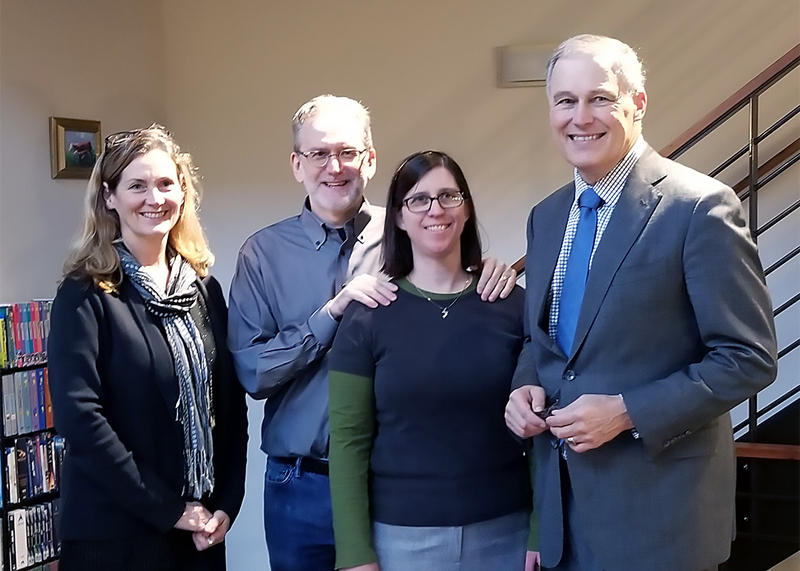 After being introduced to our neighborhood by Mayor Pauly, Governor Inslee spoke to the media, then joined Karin and I for a tour of our home. We started in our living room, where we shared with the Governor that we had watched his recent State of the State address and were impressed by the passion with which he spoke about the need to address global warming. We told the Governor that our favorite aspect of our home is the heavy insulation and air-tight envelope; those features make it easy and cheap to keep every corner of our home the same comfortable temperature without cold or hot spots. The Governor asked how our homes were heated (hydronic heat in the floors and ground-source well system—the majority of the wells are at the front of our neighborhood, along NE High Street). Karin and I also shared how, instead of paying for electricity, we net about $900 a year selling excess energy generated by our solar panels back to the grid. We paused to take a few pictures with the Governor and Mayor. Inslee remarked that he was impressed by our large video collection, joking that he didn't understand why we would watch the State of the State when we had so many movies and TV shows to watch instead. Moving upstairs to our top-level bedroom, we explained our heat recovery ventilator (HRV) in the attic and how we use the clerestory window and the stack effect to keep our place relatively cool in the summer without an air conditioner. From our top-floor deck, we looked at our view of the entire zHome neighborhood. The Governor asked if our solar panels combined power for the neighborhood. I told him no, that each of our buildings were powered separately by our own arrays. I added that we did have a community array at the entrance that powers shared things like our ground source pumps and path lights. The Governor asked if we've had to do much maintenance on our solar panels. I told him very little, but that recently we had to replace a few microinverters, as did our neighbor James. Our solar panels each have their own microinverters instead of one for the entire array, which provides greater reliability. The Governor had to get to his next meeting, so we all filed back out into the courtyard. Inslee spoke again to the media and with some onlookers, including our zHome neighbor Shirley Njos and Tiffany, a very smart high school student who lives at our next-door YWCA Family Village. The Governor and his staff then left to attend other meetings in Issaquah. Overall, it was exciting to have Governor Inslee visit our little zHome neighborhood and home. I suppose the whole visit did feel short; we didn't have time to talk about nearly as many of the features of our zHome as we wanted. But I guess we could always go on longer about the home we love. And hey, it does make you feel pretty good about your home purchase when the governor takes an interest in it!